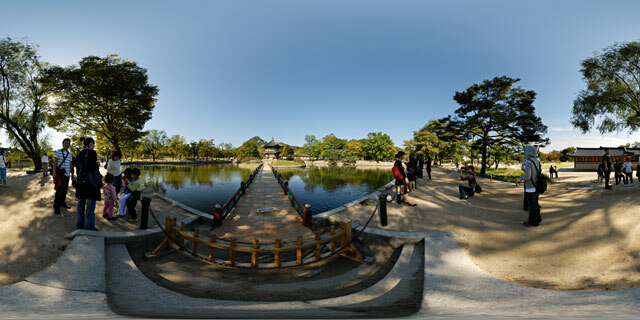 360° VR panorama of Hyangwonjeong Pavilion, Hyangwonji Lake, and Chwihyanggyo Bridge in Gyeongbokgung Palace, Seoul, South Korea. The pavilion was constructed on an artificial island of a lake named Hyangwonji (Hangul: 향원지; Hanja: 香遠池), and a bridge named Chwihyanggyo (Hangul: 취향교; Hanja: 醉香橋) connects it to the palace grounds. The name Hyangwonjeong loosely translates as “Pavilion of Far-Reaching Fragrance,” while Chwihyanggyo translates as “Bridge Intoxicated with Fragrance. Above description taken from Wikipedia article on Gyeongbokgung.